My favourite moment in any competition is the minute just before you leave isolation. All the training and preparation is over and there’s nothing more you can do. It’s just you and the climb. Six minutes to see whether you can bring out your A game and smash it in. 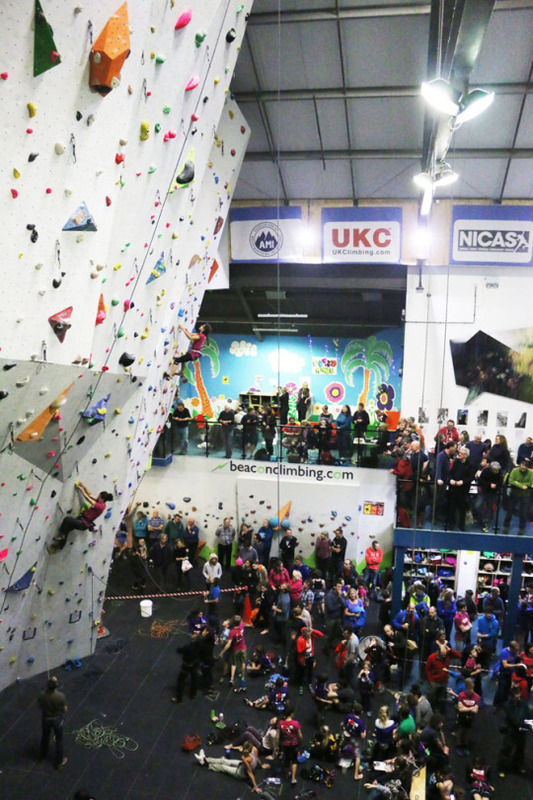 The Welsh Lead Climbing Championships at the Beacon Climbing Centre in Caernarfon a couple of weeks ago was one of the best comps I have ever been to. In an amazing feat of organisation, they ran three rounds of competition (qualifiers, semis and finals) for seven different age categories all on the same day. You’d think it would have been chaos, but it ran incredibly smoothly. The route setting was also phenomenally good. The routes looked so exciting from the ground, and were also tricky to read so you felt pretty nervous setting off. They climbed beautifully and were about the perfect difficulty in terms of splitting my group. It was definitely the most fun I’ve ever had climbing in a comp. I didn’t know any of the other competitors in my age category or the belayers or judges, but I met some really cool people who I hope I’ll catch up with again. All in all a brilliant day. Many thanks to the Beacon and all the volunteers. Roll on 2016! 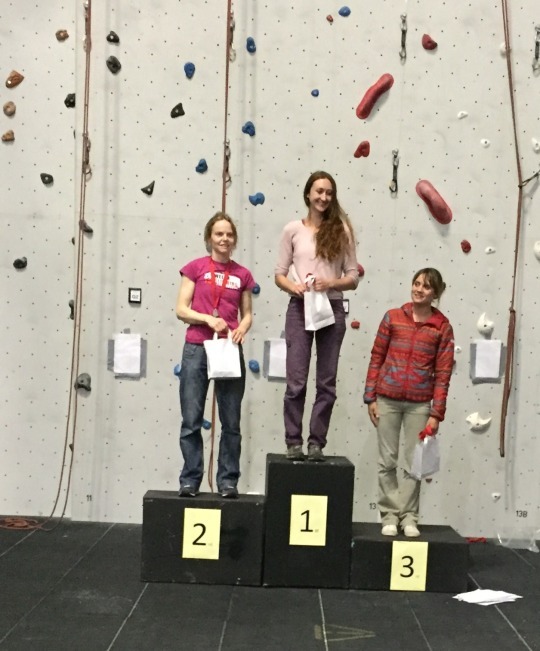 A few weeks ago Shauna asked me if I’d like to attend the Women’s Climbing Symposium in Sheffield. I must admit I was I was a little apprehensive at first. I am someone who has always climbed, and has felt very comfortable climbing, in the company of both sexes. 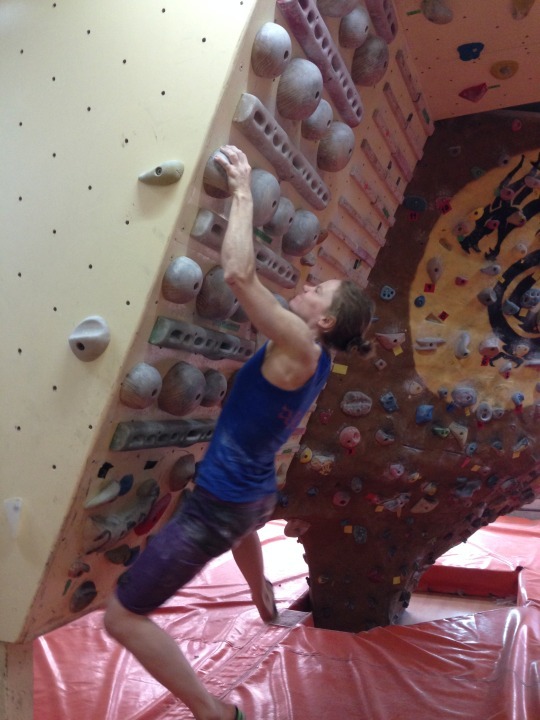 I am also equally inspired by both male and female climbing achievements and successes. I wasn’t really sure how I’d feel being part of a day dedicated exclusively to women. However, the lure of an incredible line-up of speakers proved too tempting and I decided to go along. Firstly I’d like to say what an enjoyable day the WCS was. It was incredibly well run from start to finish. From the pocket-sized timetables to remind participants where they should be at any given moment to the music which played at the end of each break to usher people to the next session, the whole day passed off very smoothly which can only have been the result of hours and hours of hard work behind the scenes. Secondly, there was a fantastic line-up of speakers. There were simply too many talented individuals giving talks to mention them all in this short report so I’ll talk about just a few which were highlights for me personally. Hearing Catherine Destivelle open proceedings with a fascinating run down of her life as climber and mountaineer was amazing. A true legend of the sport, hearing her talk and getting her to sign my t shirt afterwards pretty much made my weekend. A surprise highlight for me was Rachel Atherton. I know nothing about mountain biking so I wasn’t sure quite what to expect from this talk, but I found it interesting and engaging and, above all, inspiring. Molly Thompson-Smith’s talk was also great to hear. 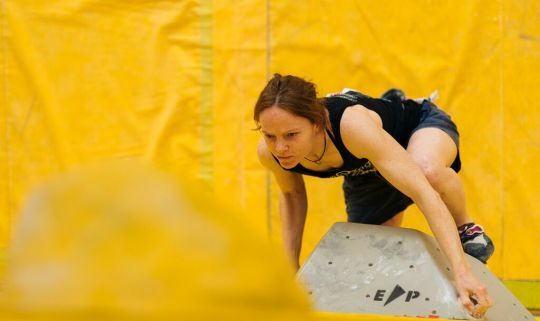 I’ve competed with Molly on a few occasions, and it was interesting to hear her take on the competition scene and how she deals with the highs and lows of competition life. Aside from the talks, something which really struck me about the whole day was just how friendly everyone was. I lost count of the number of times a complete stranger started talking to me or an event organiser checked I was having a good time. I think this friendliness is something which is common throughout the climbing world. I’ve noticed it at the crag, at major competitions and at my local wall. It’s a very special aspect of our sport, and one of the reasons I love it so much. Whether it was even more prevalent at this event because it was for women only I am not sure, but what I would say is that if anyone is wondering about coming to the Women’s Climbing Symposium on their own next year, they will certainly find a very friendly and welcoming atmosphere when they arrive. All in all, it was a very informative and interesting day and I really enjoyed it. Has it changed my opinion of women-only events? I think in an ideal world, all women would be lucky enough to have the same introduction to climbing as I had where gender wasn’t an issue. However, it seems that, for whatever reason, this isn’t the case. For many women there seems to be a real need for events such as this where they can learn from one another and be inspired in an inclusive and encouraging all-female environment, and Shauna and Emma do an amazing job at putting together an event which caters to this need. Is climbing the friendliest sport out there? I’m always impressed that, during the viewing period of major competitions, competitors help each other out by sharing beta, despite the fact that this could potentially harm their own chances of success. It goes further than that though: after the last world cup in Vail, Jan Hojer and Adam Ondra tried to persuade Nathaniel Coleman to take part in the China events as he had a good chance of getting on the podium in the overall competition. The fact that they were also vying for the top spot didn’t seem to have entered into the equation. I love this about climbing. At the crag or down the local wall you regularly see groups of total strangers sharing knowledge and discussing the best way to do things. 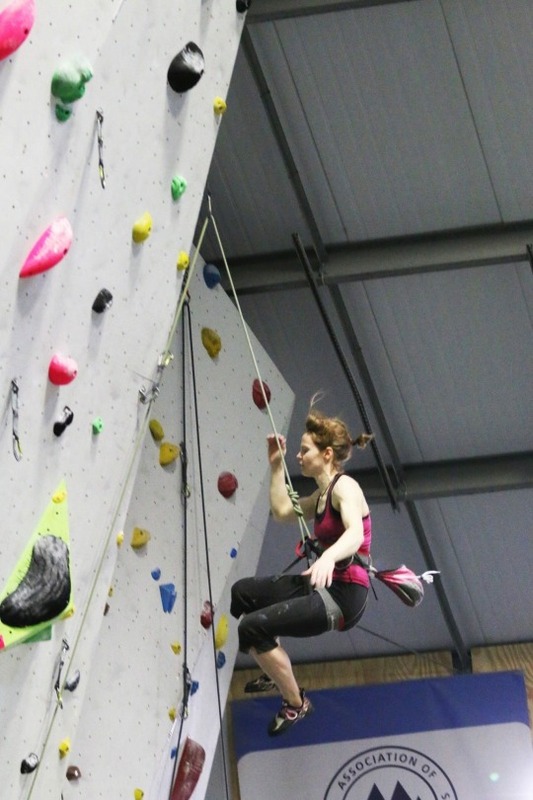 Many of the country’s top climbers live in Sheffield, and you’ll often see them chatting to, and climbing with, us mere mortals down at the wall. It seems there’s very little hierarchy in the climbing world. Training for the British Bouldering Championships this year, it really hit home to me just how great the climbing community is. Keen to work on my technique, I spent a lot of time down at the wall learning to balance my way up slabs and jump for holds which looked impossibly far away. During this time, a lot of people helped me out with advice on my technique and useful tips on how to improve. Not just my friends, but everyone from strangers I tried problems with to the UK’s top competition climbers and the route setters themselves gave me tips on things to try, and information about what to expect on the competition day itself. Isolation was also a really friendly place to be. I had always thought it would be stressful, but I spent most of the time chatting to, and warming up with, a great group of people who were psyched for their own success, but also supportive of others too. I used to have this image of sport being “every man for himself”, but I don’t think this is so true in climbing. I feel lucky to be part of something where people genuinely want to help each other out and see others succeed. As for the comp, how did it go? Well I came 19th in the end, and I achieved my aim of making semis so I was really happy. 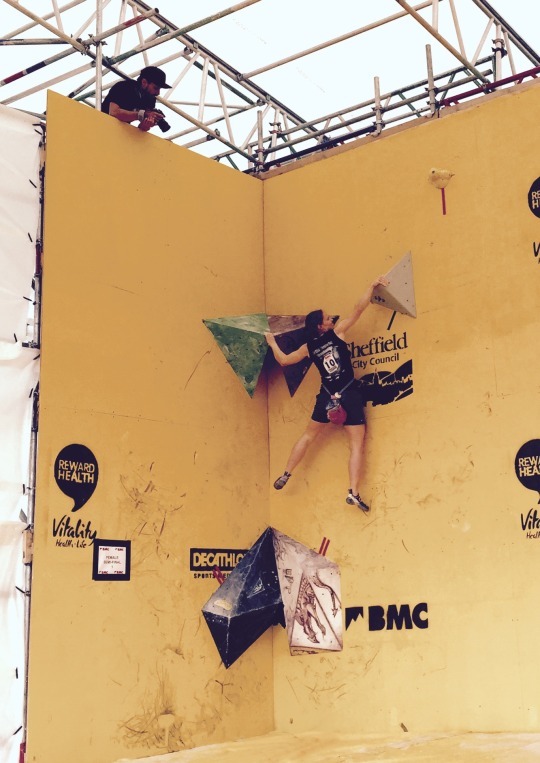 The comp wall at the Cliffhanger festival was a brilliant place to compete. The brightly coloured walls and problems looked really appealing, and the open air nature meant it felt cool and breezy. The route setters had also done a fantastic job of setting interesting problems which divided the field well (not an easy task at all, I am sure). All in all, it was a brilliant weekend - roll on 2016! This great pic was taken by Colin Perkins of Peakography - thanks Colin! The last 2 weeks I’ve been out in Barcelona working and training with my coach at his wall, Freebloc. What a great 2 weeks it’s been. Freebloc is one of the best training centres I’ve ever been to. Its steep boards are brutal, and there’s nowhere to hide. Even the campus board is 30 degrees overhanging! Here is a small video of a problem I’m trying. It’s become my project for the week and I really want to do it before I go home. I’m also learning Catalan at the moment. It’s quite an experience being a complete language beginner again. I’d forgotten how it feels to know virtually no vocabulary, and I find myself trying to learn all the grammar rules at once and then getting very confused. It feels like slow progress sometimes, but I’m loving every minute of it. Poc a poc, as they say. Why do people have so much trouble ticking their first 8a? Why does an E1 seem a much more serious proposition than an HVS? I find this a fascinating subject. It’s something I’ve experienced myself, and yet grades arefairly evenly distributed along the grade scale so it must, surely, all be in the mind. 8a, for me, was a hard grade to break into. I am not alone in this. I know of friends who also struggled to tick their first 8a, but once they did the flood gates opened and many quick ticks followed shortly afterwards. On paper, however, 8a is only a notch harder than 7c+, similar to the gap between 7c and 7c+. The only difference is that suddenly there is an 8 attached and somehow this seemly innocent number plants seeds of doubt in the minds of aspirant ascensionists. “8 must mean hard”, “Am I really an 8a climber?”. Instead of taking the route at face value, you suddenly start focusing on the number. 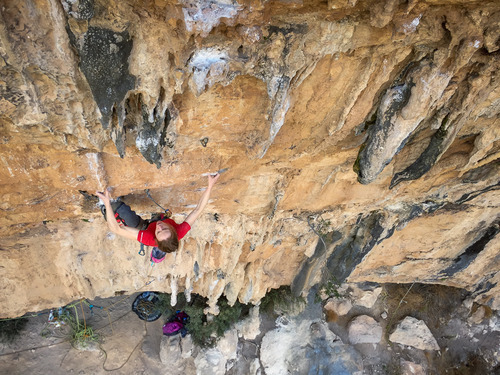 Climbers in the States struggle not with 8a but with transitioning from 5.12c to 5.13a (7c+) suggesting that it is something to do with moving up a number grade in the system. I often wonder if athletes in other sports suffer the same fate: can gymnasts nail a perfect 14.95 every time but struggle to land a 15.00? Do runners consistently place 4th, unable to make that final step up onto the podium? Last month did Andy Murray come second in the Australian Open for the 4th time for physical reasons, or mental? My head has always been one of my weakest links in climbing, and this problem of artificially constructed grade barriers has been following me around for a while. Although I’ve climbed a number of 8as and harder now, most of them have been on home soil with the luxury of being able to take my time over them. I’ve always been in awe of people who were able to rock up at the crag and just tick one off without any fuss. I used to think it was just a physical thing, but it wasn’t until a recent trip to Chulilla that I became aware I had built up a massive mental barrier about doing 8as quickly. I only really realised the problem was there after I managed to solve it. For the trip I had two goals in mind: onsight 7c+ and climb 8a in a day. Every day I threw myself at routes trying for one goal or the other. About half way through the trip I found myself at the crag one morning feeling totally burnt out. I just couldn’t face the effort any more. But we were on holiday and I felt I shouldn’t give in, so I had a flash attempt at a 7c+/8a called Tequila Sunrise. This is quite an unusual route for Chulilla in that it is not so much a technical wall climb, as a desperate thrutch up a steep corner. Not my bag at all. I predictably fell off and spent about 15 minutes not being able to do the moves. I wondered about stripping it, but couldn’t quite think what else I’d try so I lowered off with the draws still in. An hour later I tied in for a redpoint and by some miracle managed to thrutch my way through the crux and into the rest at half height. From here the route is basically over, just 7a’s worth of climbing and one tricky, but not desperate, move to the chain stood between me and glory. It was at this point that I realised I was seriously stressed out. I’d managed to keep a cool head all week, but suddenly with the prospect of a long-term goal coming true I’d turned to cheese. I knew I was stressed out because instead of enjoying it, all I could think about was the fact that if I failed I couldn’t face another go. The next 20 minutes felt like torture. The top wall was easy but insecure and I was terrified I might blow it at every turn. I shook out for far too long on every rest, just to make sure. I was also so tensed up I VERY nearly blew the tricky move below the chain which panicked me and I had to shake out again in a terrible position below the belay just to give me the nerve to finally move up and clip the chains. When I clipped the chains I felt unbelievable. So happy, and as if I had broken through some kind of invisible wall which I’d been throwing myself up against for ages without being able to break through. It didn’t matter that the route was a slash grade (7c+/8a) – there was an 8 in the title and that was enough. It fully sunk in what a big deal this had become for me a day or two after. I felt totally drained of mental effort and it took two rest days and a day of easy multi-pitching before I could face pushing myself again on the trip. 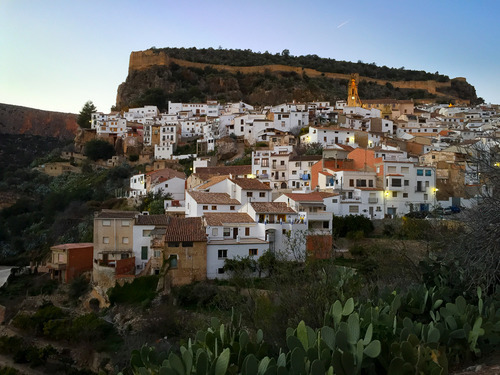 But when I did, and I got on another 8a, Los Veteranos at El Balcon, it felt totally different. It didn’t feel like a big deal any more, just a route of a suitable grade for me to be trying that day. This is how 8a’s should have felt all along. How do you stop a new grade becoming a barrier in your mind? And once it is, how do you break that barrier down? I don’t know the answers to these questions, but if anyone does I’d be really interested to know.